The current Ferrari 458 may be the last naturally aspirated mid-engined V8 car to come out of Maranello and there is already talk of collector status. Now those that ordered the ultra hot 458 Speciale are allegedly being told to pay more and add extra options or risk losing the order to someone else. 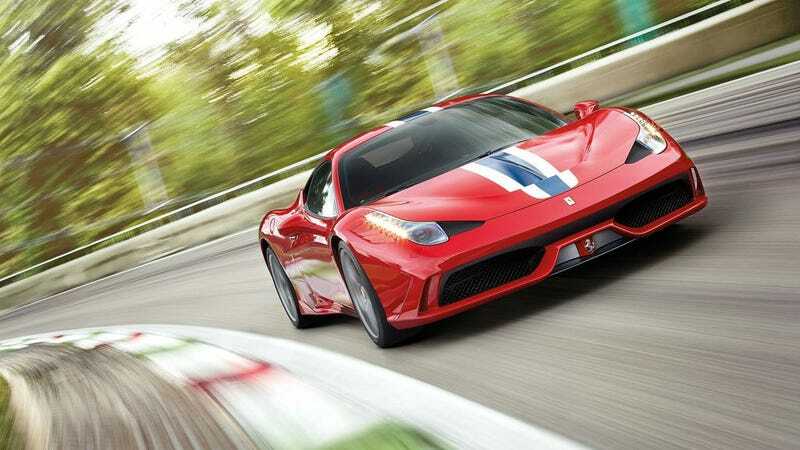 Motoring Research.com says there were told by lending specialists Magnitude Finance that even though Ferrari dealers are taking the £20,000 (aprox $25,000 USD) deposit, customers are being warned that if another buyer comes along and specs out a more expensive car, that vehicle will take priority on the order. "One client ordered the car many months ago but he was subsequently advised to increase the options he selected to guarantee delivery simply because others are prepared to pay over the odds to get one new. "We have another client who has successfully secured the car using our finance and he said between placing his deposit and the balance, the agent he bought it from contacted him on five occasions to say others wanted to buy it if he changed his mind." "Everyone we speak to sees this as the next appreciating model over the long-term like the 360 Challenge Stradale and 430 Scuderia 16M before it, so demand is really high. While many folks will chalk this up as nothing more than a "first world problem," you can imagine the frustration of a Ferrari customer who placed an order months in advance for a car the exact car they desired, only to be told they have spend even more money on options they don't want to in order to maintain their reservation.